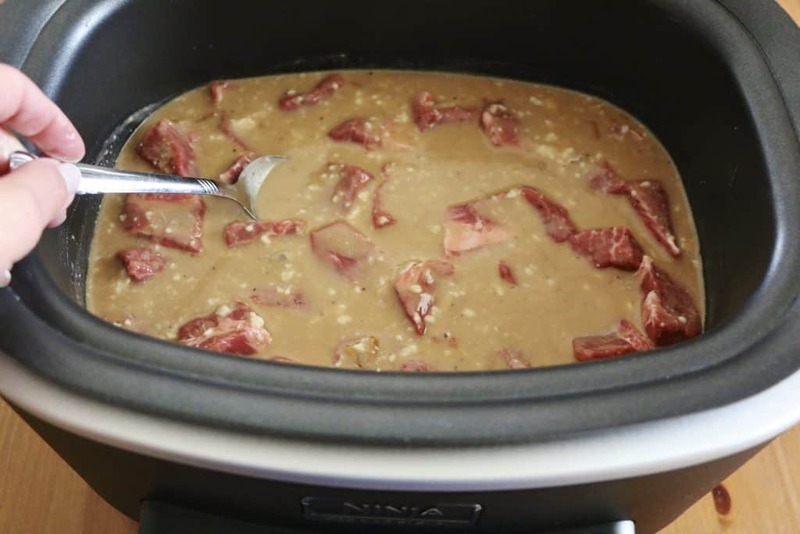 Crock Pot Beef Tips and Gravy is a simple slow cooker recipe that is made with chuck roast, beef broth, cream of mushroom soup, onion soup mix and a special seasoning. Want to make your own onion soup mix? Be sure to try my HOMEMADE DRY ONION SOUP MIX. It works wonderful in this meal! 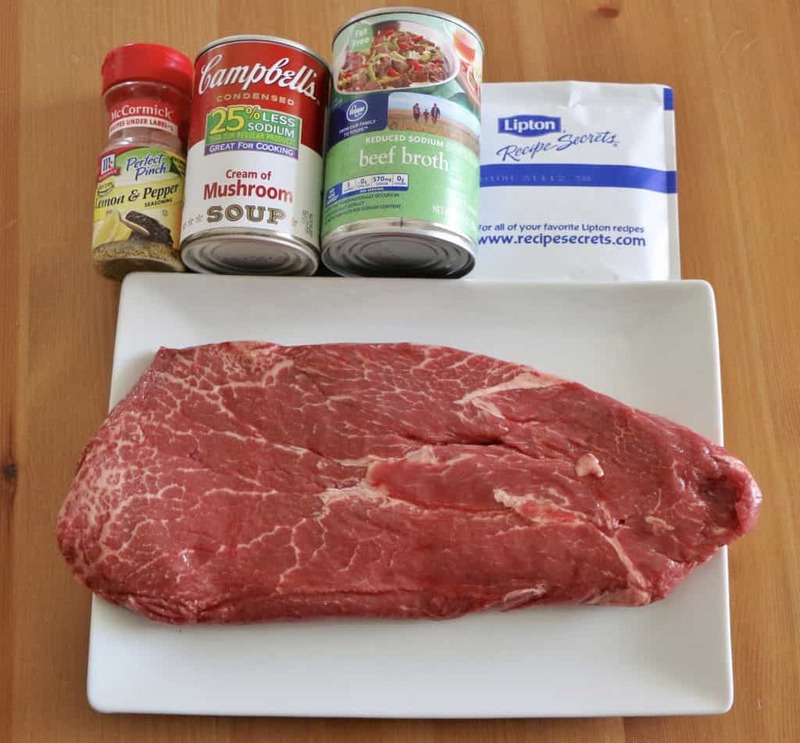 WHAT CAN I SERVE WITH BEEF TIPS? 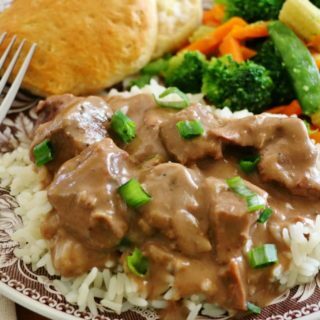 I like serving beef tips over rice to take advantage of all that yummy gravy! You can also serve with my MILLION DOLLAR MASHED POTATOES or just some simple egg noodles. Also, we really love these MAPLE GLAZED CARROTS as a veggie side dish! Note: I am using a Flat Iron cut of Beef Chuck Roast. Any chuck roast will work. I got a great deal at Kroger on this so that’s why I went with this particular cut. 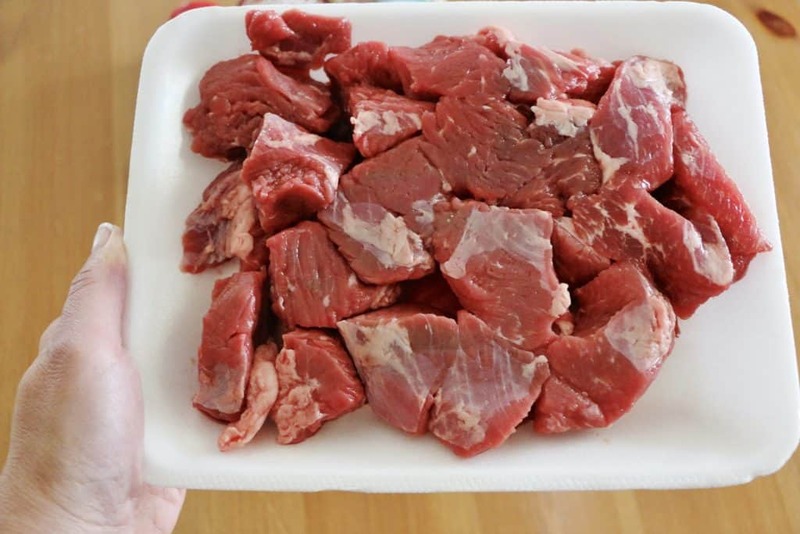 Also, you can purchase pre-cut stew meat (like the picture below) to save on time. Cut beef into about 1 1/2-inch cubes. 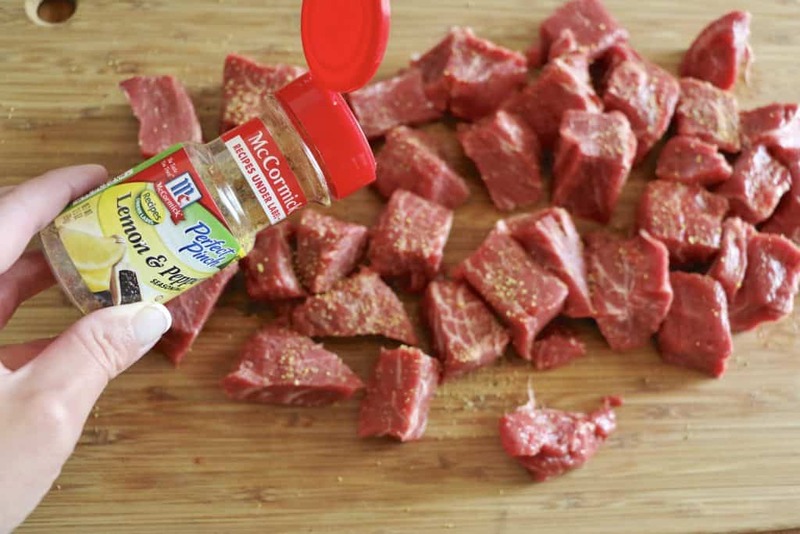 Sprinkle lemon pepper seasoning on beef. Add meat to crock pot and give it all a good stir. Cover and cook on low for at least 6-8 hours. Then pour in 2 cups of the beef broth mixture into the butter/flour mixture. What I like to do is scoop all the beef tips out of the crock pot and put them in a bowl or on a plate. Then pour 2 cups of the beef broth mixture into a measuring cup. 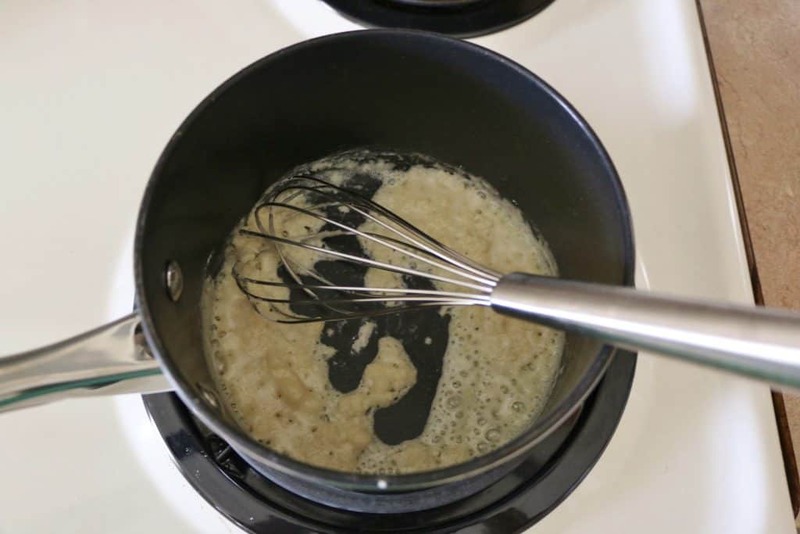 Whisk it together until smooth, then bring the heat up to high (while whisking briskly the whole time.) It should quickly begin to thicken. Once it gets to your desired thickness, take it off the heat and pour it back into your crock pot. Then add the beef tips back in and stir well. Then serve over rice, mashed potatoes or egg noodles! Cook’s note: If you don’t have cream of mushroom soup, you can substitute cream of chicken. But I will tell you that neither my husband and I enjoy mushrooms and we enjoy this. You don’t taste any mushrooms as an ingredient in this. 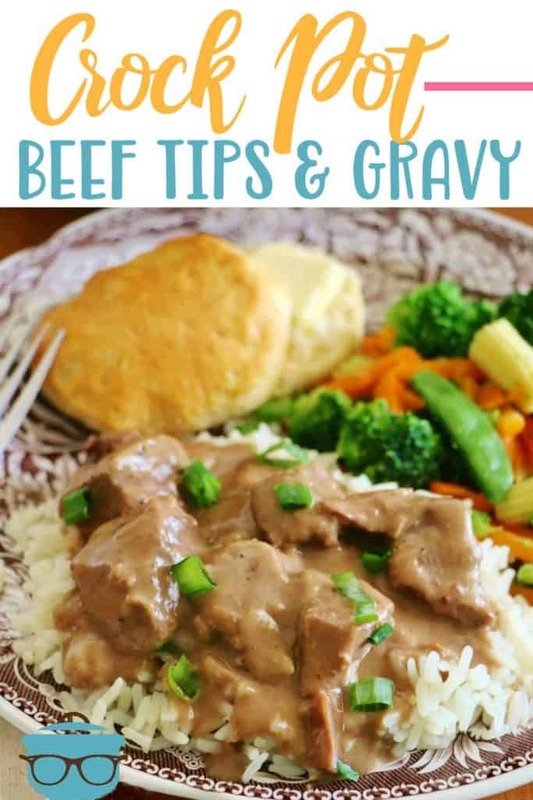 Crock Pot Beef Tips and Gravy is a simple slow cooker recipe that is made with chuck roast, beef broth, cream of mushroom soup and a special seasoning. 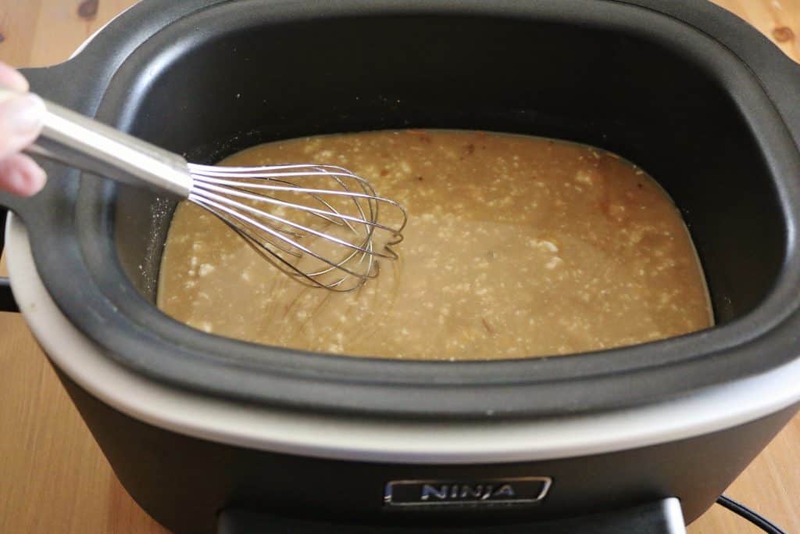 In a 5 quart slow cooker, combine dry onion soup mix, cream of mushroom soup and beef broth. Whisk to combine (don't worry if there are lumps, they will come out as it cooks). Cut beef into about 1 1/2-inch cubes. Sprinkle lemon pepper seasoning on beef. Cover and cook on low for 8 hours. You can serve this up just as it is when it is ready or you can easily thicken up the gravy part. In a medium pot, melt two tablespoons of butter. Once it is melted, add in about 3 heaping tablespoons of flour. Then pour in 2 cups of the beef broth mixture into the butter/flour mixture. 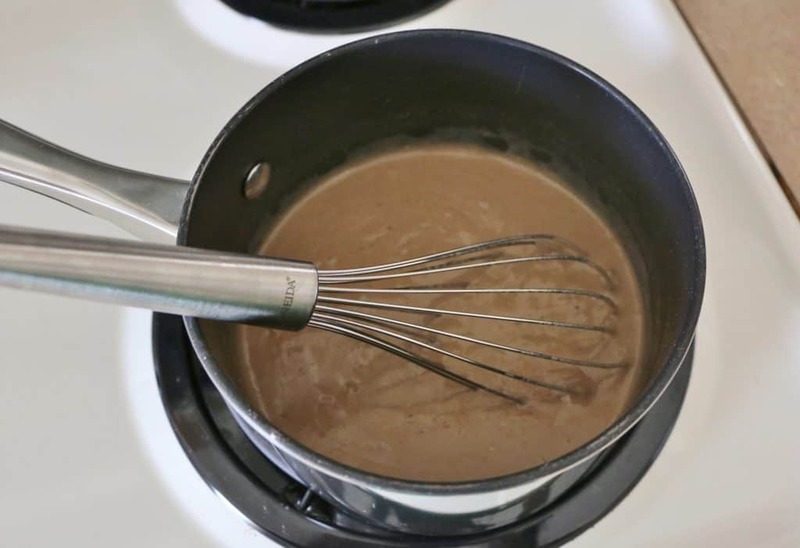 Whisk it again until smooth, then bring the heat up to high (while whisking briskly the whole time.) It should quickly begin to thicken. Once it gets to your desired thickness, take it off the heat and pour it back into your crock pot. Then add the beef tips back in and stir well. Serve over rice, mashed potatoes or egg noodles! 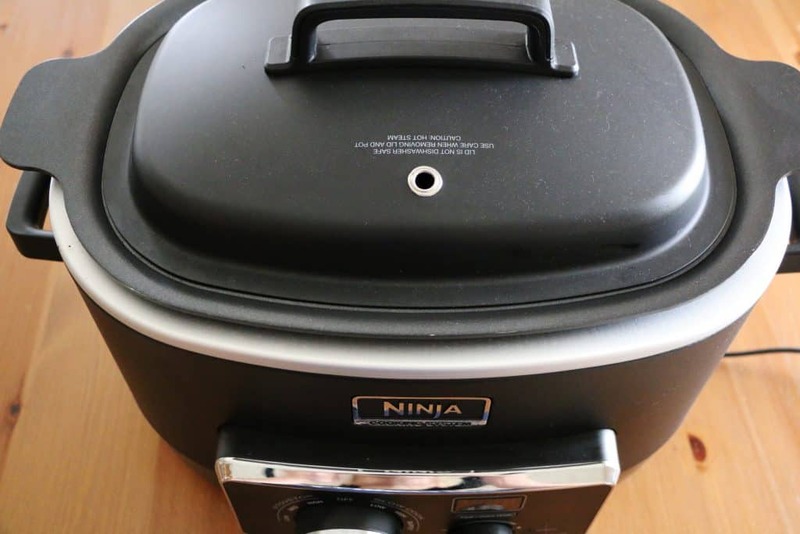 Want more easy, fan-favorite crock pot recipes? Be sure to try these! This was great! I just have to echo what everyone else said about the Cream of Mushroom. Don’t switch it out with something else. Husband and I do not like mushrooms but I always make a recipe as it is written the first time so I can properly judge. I would not change a thing on this. It was SO good. I was skeptical but it was AWESOME!! Looks so warm and inviting and delicious! Putting the ingredients on my shopping list right now! Thank you for sharing! My husband hates onions of any form. Can you suggest a substitution for the onion soup mix?? I have a kid who really does not like mushrooms. Not the taste – the texture. I ignored it for years but he's so good about eating other things, I decided it really was an aversion. I don't like some food stuffs either. I mixed the broth in the mushroom soup and strained it. It was easy. He loved the beef tips and was grateful I took the extra time. Is it possible to put in potatoes and carrots to make a beef stew. It looks wonderful and I'm dying to try it….. I bet you could, Janice. If you're only adding a few potatoes and carrots, it'll probably be fine. 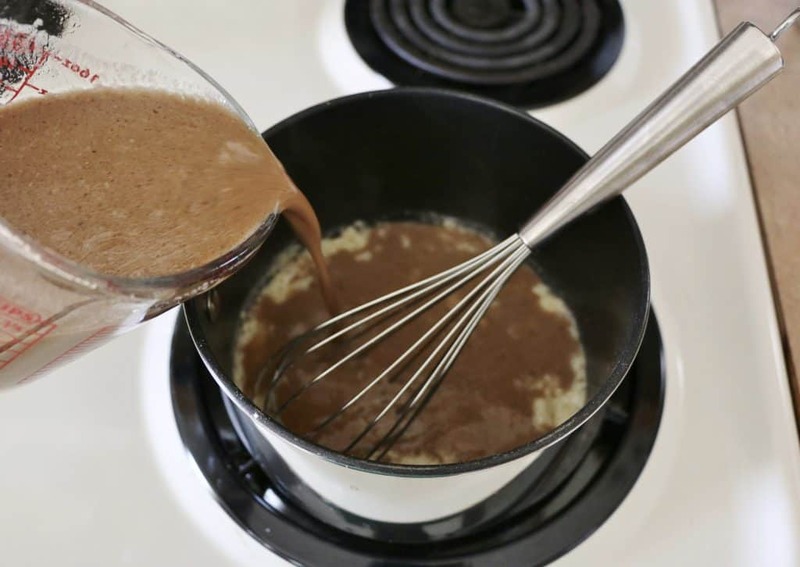 If you're adding a lot, maybe double the soupy ingredients to ensure you have enough gravy? We love this recipe at my house! The itty bitty mushrooms in the cream of mushroom soup are ridiculously tiny. So you don’t taste or even see them really. Don’t sweat the cream of mushroom soup – it really makes this dish. For those with allergies, there are TONS of internet recipes to make your own cream soups. Brandie – don’t stop sharing recipes like this. We love them. I work two jobs and so does my husband. I *need* more recipes like this so I can feel good about cooking for my family and not always picking up fast food. Bless you! I was reading all the comments so had to comment myself. Y’all – there is this thing called the internet. You can google substitutions. Seriously. Someone gives you a recipe and you want a million substitutions just go to Google and see what is available. Do you think Brandie has made this in all the ways possible? I doubt it. Or else she would’ve given you all the substitution options. If your “hubby” doesn’t like onions then tell him to make his own darn meal or how about you just don’t make this recipe and move along? Your “hubby” doesn’t like mushrooms. Again, tell your dearest to make his own darn meals if he is so dang picky or better yet, make something else. Again – GOOGLE is your friend! This was wonderful – AS IS – and I made it for myself just as written! Peggy, your comment made me giggle. I will say that you are right in that I have only made it this one way. We like it so I have not tried any substitutions so I honestly cannot speak to any changes. Glad you enjoyed it! This was delicious you can’t taste any mushroom and hubby who doesn’t like mushroom had no idea and couldn’t devour it fast enough. This one is a keeper. Sue, that is always what I tell folks. It adds flavor but you don’t taste it as a separate ingredient I don’t like mushrooms either. LOL! Thank you for letting me know you liked it! Made this tonight for dinner!!! It’s actually one of my favorite dishes to make, but rarely have the time to do it on the stovetop, this is hands down my new favorite slowcooker meal, put it in before I left for work this morning, and came home to a delicious meal, with very little more to do before dinner was on the table!!!! And the kiddos LOVED it too, thanks for sharing your recipe!!!! I am so glad you and the family enjoyed it. It is one of my crews favorites. Thia is delicious and so easy. The roux was easy and turned out well. A new try for me! This goes into my repeat file, for sure! Thank you for sharing. I love your posts. Yay Pam! Thanks so much for coming back to let me know! Yum! I’m (impatiently) waiting for this to cook right now. I’m doing it on high for 4-5 hours instead of low for 8 because it’s already 6 pm here. I added in a handful of chopped onions and plan on making the gravy fairly thick. I’m pouring it over mashed potatoes and a thick slice of texas toast to make open-faced beef sandwiches (my latest pregnancy craving!) Serving with a side of either peas or mixed veggies and ending with a dessert of chunky banana pudding and vanilla wafers. My mouth is watering just typing this. Thanks so much for this recipe! Oh my goodness! Now you’re making me hungry! ??? ?Congratulations on your pregnancy! Yay! I’m a firm believer that pregnancy cravings must be indulged! I made this recently in my Instant Pot and it was delicious! Tasted like it cooked all day in the crock pot but it didn’t take near as long! Love this recipe! Just want to say a BIG THANK YOU for this recipe! I have made this 4 times now, and I am again today. My entire family LOVES it; and my daughter is probably one of the most pickiest eaters ever! Also – you can use the strainer idea to strain the onions out of the soup mix (just shake it slightly- don’t use a spoon or the onions will break and go thru the strainer). I am severely allergic to onions so I have to do this all the time with many different foods! This was easy and good. I used stew beef and regular cream of mushroom soup. It was a tad bit salty, so I’ll use the lower sodium soup as recommended next time My family ate it all, so I’ll make it again. 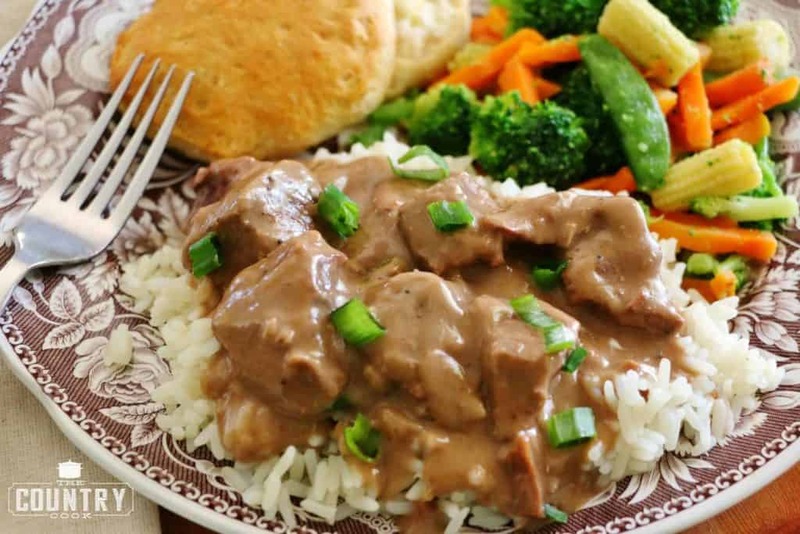 I fixed the Crock Pot Beef Tips for supper tonight! Delicious and the meat was so tender and the gravy so yummy! My husband had seconds. 🙂 The only thing I did difference is: for the gravy, I used cornstarch & water mixture to thicken it up a little. I made the Crock Pot Lasagna the nigh before. It turned out awesome! My husband loved it and had seconds there too. and Lasagna isn’t a fav of his but it is mine so we have it here & there..Thank you for the awesome recipes.. Going to look to see what is next…. I am looking forward to making this. I just find it a little strange to use lemon pepper seasoning on the beef. Looks very good! If I want to double the recipe should I completely double it all? It seems like using my crock pot, a little liquid goes a long way. Thanks for any suggestions and advice. Wow – this was SO easy but SO good. We all loved it!! Wouldn’t change a thing! Could fresh sliced mushrooms be added to the recipe along with all of the other ingredients.